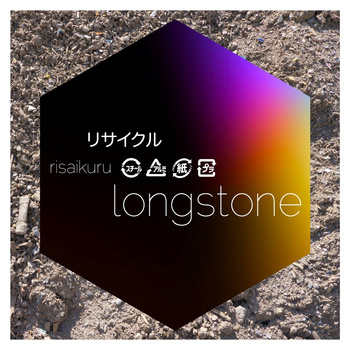 The title of this new release by the UK electronic group Longstone is Japanese for “recycling.” Recycling here carries many different meanings. First is the impetus behind the recording—the recycling and reconstruction taking place in Japan’s Miyagi prefecture in the wake of the highly destructive tsunami that hit there in 2011. In 2013 Longstone’s Mike Ward visited Onagawa and Enoshima in Miyagi prefecture, taking photographs of post-tsunami rebuilding and making field recordings. Two of these photographs, one from each of the towns Ward visited, served as the inspiration for the two long tracks named for them. Recycling—of instrumental and sound materials—is at the heart of the resulting music. The instruments include junk percussion, cigar boxes repurposed as guitars, and a (salvaged?) piano frame. Ward’s field recordings are reused as musical elements, while other sounds are recycled through electronic processing. Both Enoshima and Onagawa feature heterogeneous sounds in contrasting relationships, but in both tracks chord progressions or recurring musical motifs provide the continuity and underlying structure that keep them coherent. Onagawa is additionally structured through regular rhythms. The final two tracks, brief radio remixes of material from the longer tracks, stand as a kind of conceptual witticism on the theme of recycling. The concert will feature a transcription Stravinksy’s Firebird suite, the fourth of Rzewski’s “Four Pieces, Federico Garcia’s new Rendering, John Arrigo’s “Fantasies for Piano Solo”, and Matthew Heap’s On the Ceiling of the Sky performed by Eastman graduate and new music specialist Jacob Ertl. This is the first of Alia Musica’s guest recitals of 2014-15, hosted by Kip and Desiree Soteres. Two years after the release of their impressive debut Sky Bleached, Dylan Ryan/Sand release Circa, a purposeful continuation of the aesthetic that the group had fostered on its first record. Circa, which features guitarist Timothy Young (David Sylvian, Reggie Watts, Wayne Horvitz), bassist Devin Hoff (Nels Cline Singers, Yoko Ono, Cibo Matto) and leader/composer/drummer Dylan Ryan(Cursive, Herculaneum) has a wholly unique style which ranges from incendiary proto-metal-esque solos to sludge-trodden group play. Tickets: General admission is $15; students and senior admission is $10. Advance tickets are $12 and $8. Call 412-422-8042. IonSound delves into the compositional process this season presenting three concerts packed with premieres. The first offering, Roots and Routes, is right around the corner on Sunday November 16, at 7 p.m. This program features early and/or pivotal works by composers such as Lee Hyla, Steve Reich, Erwin Schulhoff, and Max Bruch. Also featured will be works by three Pittsburgh based composers, Roger Zahab, Jonghee Kang, and Lenny Young. Pauline Kim Harris, Joan La Barbara, Elliott Sharp and many more! The scope of Zorn’s oeuvre, complete with the technical and conceptual demands it can make on musician and listener alike, will be on vivid display in a retrospective program at NEC’s Jordan Hall on Tuesday. The event is particularly unusual given Zorn’s direct involvement as co-curator. Attendees will also get an opportunity rarely afforded to journalists — he’ll take questions from the audience before the concert. Peter Evans/Sam Pluta Duo + Archer Spade with Toshi Nakamura Sam Pluta and Peter Evans use all they have developed from their experience together to forge a new and dynamically interactive music, and Archer Spade collaborates with Japanese veteran no-input mixing board master Toshimaru Nakamura…. INTERPRETATIONS: Marie Incontrera & The Eco-Music Big Band “Tribute To Fred Ho” // Warren Smith Ensemble An evening of new compositions expanding the tradition of jazz and improvisation. John Zorn’s Cobra (30th Anniversary!) One of the most often performed compositions in new music, the phenomenon of John Zorn’s Cobra lives on into the 21st Century with continuous monthly performances in Japan, Europe, Australia and the United States….